compare – after we give you a free X-ray & comprehensive oral exam. We're committed to delivering great value and complete care, and we invite you to see for yourself how to Save-On your dental care. We will fit you with a temporary bridge while we wait for the lab to craft your permanent bridge. This will protect the abutments and the exposed gum areas and look more appealing than having a missing tooth. When the permanent bridge has been created, you will have a follow up visit to set the bridge. 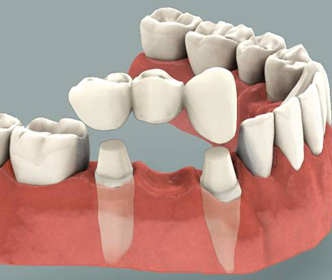 It will be placed on the abutments, and the dentist will then use an adhesive to make sure that the bridge is set.